Bands will join Bon Iver and Skrillex and more than 150 other acts during four-night festival. 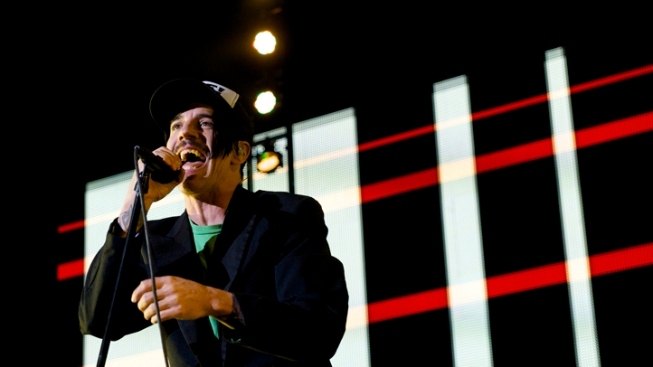 Anthony Kiedis and the rest of the Red Hot Chili Peppers will headline the 2012 Bonnaroo Music Festival this year alongside Phish and Radiohead. The 11th annual fan-friendly and jam-band styled Bonnaroo music festival will have some musical heavyweights headlining an already strong lineup this year. Bonnaroo confirmed earlier today that Radiohead, Phish and the Red Hot Chili Peppers will front the four-day festival in Manchester Tenn from June 7-10, joining recent Grammy winners Bon Iver and Skrillex. Radiohead makes their return to the festival, having not performed there since 2006. Phish fronted two nights of the festival in 2009 and even brought Bruce Springsteen out to jam during one of their sets. The Chili Peppers will use the festival as a part of their upcoming North American tour for their new album, "I'm With You." In a nod to the low-key atmosphere the festival is known for, performers are often seen watching other acts among the fans. Jam sessions are almost happenstance, with the list of diverse names making for once in a lifetime collaborations. Rather than commit themselves to one particular genre of music, Bonnaroo is consistently able to get acts from all across the musical spectrum. This year Alice Cooper, The Civil Wars, The Shins, Ludacris and a reunited Beach Boys and Ben Folds Five will perform as well as up and coming acts such as Young the Giant and Childish Gambino.